Maretron’s DSM410 is a 4.1" high-resolution sunlight viewable color display that interprets and displays NMEA 2000® instrument, navigation, and vessel monitoring data. 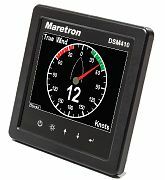 The DSM410 is a user friendly dedicated marine display with custom screen configurations and an easy-to-use five-key illuminated keypad. In addition to the monitoring and display capabilities, the DSM410 features an alert/alarm package and electrical switching capability.